The Australia Financial Review is proud to be hosting the fifth annual AFR Higher Education Awards on Tuesday, 27th August 2019 at the Hilton Brisbane. Presented by UniSuper, the Awards are an initiative to highlight at a national level the tremendous contribution that the Higher Education sector makes to Australian prosperity and quality of life. The Awards will be judged by an independent panel of eminent Higher Education veterans. UniSuper is Australia’s dedicated superannuation fund for people working in the higher education and research sector. With approximately 400,000 members and around $66 billion in net assets under management, we’re one of Australia’s largest super funds. For more than 30 years, UniSuper has worked alongside Australia’s universities and research institutes delivering high quality, value-for-money retirement saving products and services. 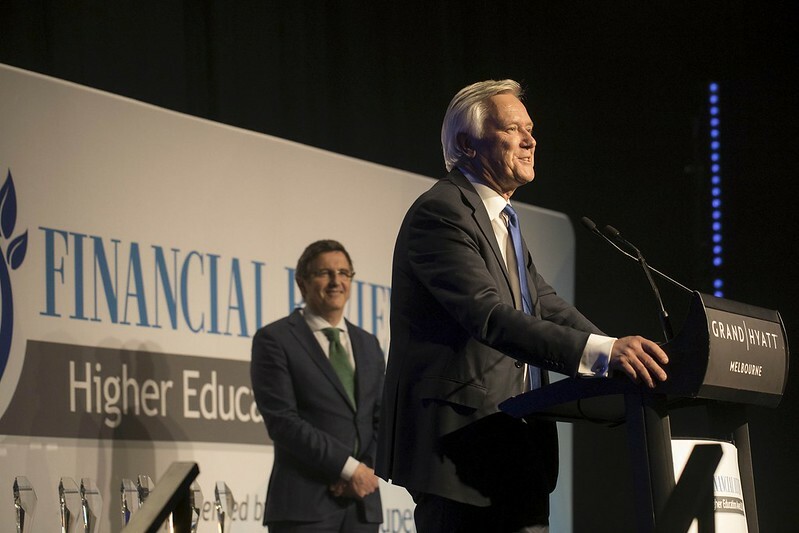 We are proud of the contribution the higher education sector makes in Australia and are thrilled to be the presenting partner at this year’s AFR Higher Education Awards. We have assembled an independent judging panel composed of some of the most esteemed figures in Higher Education: former Vice Chancellors, former Chancellors, and experts from the worlds of international, online and private Higher Education. This distinguished group will meet in early October to review applications and select a shortlist of up to four finalists including an Award winner, for each category. Our judging panel will look for evidence of innovation, impact, clear improvement in outcomes, value/efficiency and solid outcomes related to the sector’s core educational mission. The most outstanding initiatives may not be the largest or most high-profile: the judges will take into account wherever possible the specific scale, resources, and challenges of the applying institution. We encourage Higher Education institutions of all sizes and types to make a case for the initiatives of which they are most proud. The winners of the AFR Higher Education Awards will be announced and honoured at a sumptuous Gala Dinner, presented by UniSuper, on Tuesday 27th August 2019. The Gala will take place at the Hilton Brisbane. The evening will commence with a drinks reception, followed by dinner and the presentation of the AFR Higher Education Awards. The dress code is cocktail/business attire. The AFR Higher Education Summit will take place on 27-28 August 2019 at the Hilton Brisbane. For more information and to register, please click here. 1. What are the deadlines for 2019? 2. How much does it cost to enter the awards? Nothing – entry is free. These awards are open to all institutions, public and private, that are listed in the TEQSA National Register of Higher Education Providers. This includes self-accrediting institutions (including universities) and TEQSA-accredited institutions offering Australian Qualifications Framework qualifications at associate degree level and above, and/or diplomas and advanced diplomas accredited in the Australian Higher Education sector. Institutions operating across multiple educational levels (ie VET and HE) must clearly show that their nominated strategies or initiatives are drawn from the HE side of their business. As well as Higher Education Providers, this award is also open to any Australian-registered company developing education technology products and services used in higher education. Eligibility in this category does not require companies to be listed in the TEQSA National Register of Higher Education Providers. 4. Can we enter more than one category? Institutions may enter as many categories as they wish, but a separate submission form must be completed for each category. 5. Can we submit more than one entry in a single category? Only one entry per institution per category is allowed in most categories, which is why we require sign-off by the head of the relevant institution. The exception to this is the Lifetime Achievement award, for which we will accept nominations/applications from anyone without the need for institutional sign-off. 6. What time period do these awards relate to? Applications should reflect strategies or initiatives with core achievements in the period 1 January 2018 to June 2019. Naturally, projects that have had sufficient time to produce results and show real impact are more likely to be successful than projects still in their preliminary stages. 7. How will I know that my submission has been received? Once you have pressed the submit button, you will see a confirmation page indicating the successful receipt of your entry. You can then return to the Awards homepage to make further applications in other categories. Please advise us if any of your contact details change once your application has been submitted. 8. Are collaborative entries accepted? Yes, but the application should come from a single lead institution. You can name any other contributing HE institutions or external partners in the ‘Institution name’ field on the application form, and if your submission is shortlisted, we will give due credit to partners at the awards ceremony and in any media features or profiles. 9. When is the closing date for entries? Applications close at midnight on 30th June 2019. 10. How are the entries judged? An eminent panel of Higher Education experts will meet to review applications against the selection criteria and choose our winners. See the JUDGING section of this website and well as the individual selection criteria of each Award. 11. When are finalists announced? A shortlist of finalists for each category will be announced in The Australian Financial Review on 6th August 2019. 12. When are winners announced? Announcement of the winners will be made at the Awards Gala, sponsored by UniSuper, on the 27th August 2019 at the Hilton Brisbane. 13. Can I re-enter the same initiative/strategy/project next year if I don’t win this time? Yes. Very promising initiatives may simply need slightly more time to be able to sufficiently demonstrate their full impact. We will happily consider repeat entries in 2017, provided they show further evidence of positive outcomes. 14. I won last year; can I re-enter this year? You cannot re-enter the same initiative/strategy/project in the same category that it won last year, though you could potentially enter it in a different category, if you can make a strong case for it. However, you can certainly enter a different initiative/strategy/project in the same category you won last year. 15. How do I book tickets for the event? 16. What is the dress code for the evening? The Awards Gala is Cocktail/Business Attire. 17. What happens if I have purchased a ticket but am unable to attend? Tickets are non-refundable but can be transferred to a colleague. In the event of a change in attendee, please email the new attendee’s details to info@informa.com.au as soon as possible. 18. Are under-18s allowed to attend the awards evening? The venue’s licence does not preclude under-18s from attending; however we do suggest that the event might not be appropriate for younger children. In addition to the above eligibility for Higher Education Providers, this award is also open to any Australian-registered company developing education technology products and services. Eligibility in this category does not require companies to be listed in the TEQSA National Register of Higher Education Providers. Please read the guidelines below and the selection criteria for each award. When you are ready, click APPLY NOW from the bar on the right and select the category you wish to enter. The AFR Higher Education Awards are open to all Australian Higher Education institutions. All applications for the 2019 AFR Higher Education Awards must be made online via our application portal. Submissions are limited to 500 words (text only) and must clearly address the key selection criteria. The selection criteria can be viewed HERE. You may also attach up to four A4 pages of supporting evidence (e.g., statistics, graphs, research or evaluation reports, photographs, press cuttings or testimonials) in PDF format, with relevant sections highlighted as need be. Please do not, however, rely on these supporting materials to make your case; they will not necessarily be considered unless your application is shortlisted. Please note that videos or PowerPoint presentations will NOT be accepted. Applications should reflect strategies or initiatives with core achievements in the period 1 January 2018 to June 2019. Naturally, projects that have had sufficient time to produce results and show real impact are more likely to be successful than projects still in their preliminary stages. Please note that more specific rules with regards to timeframes and eligibility apply in some categories. Institutions may enter ONE application per category, with all applications requiring sign-off by the head of that institution. Collaborative initiatives, projects or strategies can be entered, but the application must come from a single lead institution. Additional contributing HE institutions or external partners can be noted in the ‘Institution name’ field on the application form, and if your submission is shortlisted, we will give due credit to partners at the awards ceremony and in any media features or profiles. Once you have submitted your entry you will receive an email confirming your submission. The email may be in your junk inbox if not received within the hour. Please advise us if any of your contact details change once your application has been submitted. Our distinguished panel of experts will meet in July to review applications. They will select a shortlist of up to four finalists, and an Award winner, for each category. Please contact the HE Summit’s Higher Education Analyst with any further questions about the Awards.